Toyota’s new RAV4 will bring much tougher styling and petrol/hybrid powertrains as the brand pushes ahead with plans to axe diesels from its European line-up. The new RAV4 includes petrol and hybrid engines but drops diesel from the line-up. 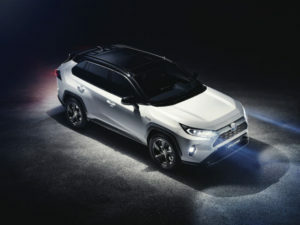 Unveiled at the New York International Auto Show and due on sale from next year, the fifth-generation RAV4 debuts the Toyota New Global Architecture (TNGA) platform used on models including the Prius and the forthcoming new Auris. Developed with a low centre of gravity and optimised weight distribution, this will bring about improved driving dynamics, according to the brand. The new RAV4 is also slightly wider and longer and gains a 30mm longer wheelbase too, bringing increased cabin and luggage space. Powertrains will comprise new 2.5-litre hybrid and 2.0-litre petrol units, said to be more powerful and fuel efficient than the current line-up, although Toyota did not announce figures. The petrol engine will be available with a choice of manual or automatic transmissions and features an updated AWD system that brings a rear disconnect on the automatic transmission versions. The 2.0-litre D-4D on the current RAV4 engine line-up will not be carried over or replaced, in line with Toyota’s announcement at the Geneva Motor Show that it will have no diesel passenger cars on sale in Europe by the end of this year. At the show, Johan van Zyl, president and CEO of Toyota Motor Europe, said the carmaker’s registrations have become increasingly weighted towards hybrids since 2015, when sales were split evenly between hybrids and diesels. This includes the RAV4, which is seeing growing numbers of customers opting for hybrids according to the brand. Other changes for the RAV4 include more robust styling and updates to the model’s quality.